The Aigle Parcours 2 Vario Outlast is the new revolutionary take on the Aigle Parcours 2 Varios in that the outlast lining keeps feet warm in the winter and cool in the summer. 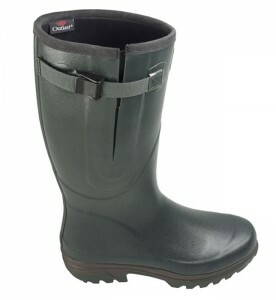 This boot is proving to be a great all year round boot with exceptional comfort and walking boot technology. The lining absorbs excess heat and then returns it when needed. Still Handcrafted in France with high quality Gomma Plus natural rubber and the result of the combination of our skills in rubber technology and our experience in hiking. The Aigle Parcours 2 Vario Outlast is still a hunting boot designed with a hiking concept sole and a polyester knit, sanitized and treated, rot-proof, washable and fast-drying lining. They have Dual composite Actigrip rubber and are resistant to abrasions and heat. The Aigle Parcours 2 Vario Outlast have excellent grip around the ankle giving perfect stability and self-cleaning soles. 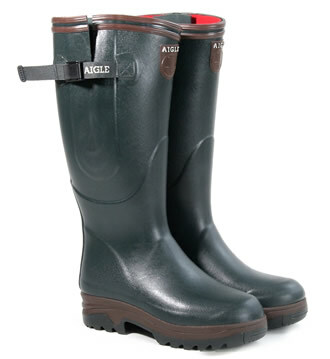 Aigle’s Gomma Plus upper material is a mixture based on flexible rubber. It is designed to stand up for many years against the conditions associated with being outdoors, including liquid manure and the ozone. It is also resistant to the ageing process linked to long periods of storage. The Softex non-woven polyamide lining is a great absorber of perspiration and is fast drying to leave a comfortable, pleasant feel. The lining is also sanitized leaving a rot-proof finish. this treatment remains in place even after washing. Established in France in 1853 by the American Hiram Hutchinson, AIGLE (‘EAGLE’ in English and pronounced ‘Eh-gleu’) today stands for uncompromising quality combined with superb design and craftmanship. The majority of AIGLE rubber footwear products are still handcrafted in France, using the best natural rubber available and a century long experience in the vulcanisation of rubber. In 1853, Aigle revolutionised the world of footwear by using rubber as its core material for boot manufacture. Boots continue to be made by hand at Ingrandes, France. From preparation through to finishing, each stage takes place under the watchful eye of their specialists. Firstly, the natural rubber mix endows the boots with all of their characteristics (suppleness, waterproofness, sturdiness, comfort, etc.) Then the parts are assembled by hand on an aluminium last. The 3rd stage in the process involves vulcanisation of the boots in an autoclave at 140° to give them their definitive shape. Finally, each boot is carefully inspected to ensure that a high-performance, high-quality product is obtained. Aigle is No. 1 worldwide for the manufacture of high quality hunting boots. (Parcours 2 Vario, Parcours 2 Iso, Parcours 2 Iso Open and Parcours 2 Vario Outlast) Aigle Wellington Boots have become extremely popular with walkers and farmers with their impeccable comfort and durability. AIGLE APPLIES ITS EXTENSIVE KNOW-HOW AND 150+ YEARS OF EXPERIENCE TO ENSURE YOUR NEEDS ARE MET IN EVERY RESPECT.